In which position do you usually sleep? This is also a very important question. Not only are you getting enough sleep, but how you sleep is also of great importance and it can affect your health. Sleeping on your back keeps your neck, head, and spine in a neutral position with no exerting any pressure on the back. Doctors recommend this sleeping position. This position has a positive impact on the person’s spiritual being, yet many doctors also agree that sleeping in Savasana pose is good for neck and spine health. This is the best sleeping position because you have to keep your back straight and not force it into any contortions. Additionally, back sleeping on an orthopedic mattress gives your spine extra support. You should sleep in this position every night, with or without a pillow, if you want to avoid waking up with a strained neck. You should not use too many pillows because your breathing may get affected. People who are suffering from obstructive sleep apnea or those who are prone to snoring should consider sleeping on their side. Lying on the bed on your side is helpful because it aligns the spine and averts backache. Unwanted facial wrinkles and saggy breasts can happen as a result of the downside of side-sleeping. This position is not recommended for the entire duration of the night. According to physicians, pregnant women should sleep on their left side for better blood flow to the heart, which is beneficial for both mother and baby. If you are suffering from heartburn or indigestion, this sleeping position will ease your conditions. Additionally, extra pressure can be put on the lungs and stomach and cause organ strain. You should avoid sleeping in this position because it puts a lot of strain on your spine. It can also result in “pins and needles” in your arms and legs, which is due to the pressure it applies to joints and muscles. Breathing is also restricted since your neck is also being strained. As a result of sleeping in this position, your organs’ movements slow down or totally stop because of the pressure that is exerted on them. Stomach-sleeping is only beneficial for heavy snorers because it helps them keep their upper airways open. If you want better rest with less spinal pain, then the pillow-supplemented position is good for you. Even if you prefer sleeping on your back, you can easily place a pillow between your knees without straining your spine. 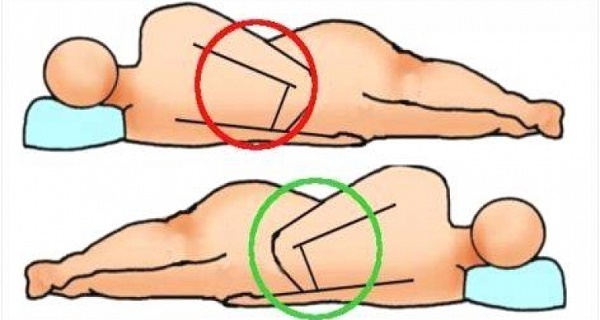 People who sleep on their stomach should place the pillow beneath the hips for extra support to the joints. If you place extra pillows at either of your sides will provide hip support, especially if you lie on your back. For complete and painless relaxation, you should place a pillow under your feet whilst you are in this position. Your body will gain numerous health benefits and your sleep quality will surely improve by maintaining a comfortable position.